The COUTELLERIE NONTRONNAISE continues its process of "reinterpretation" with these marquetry models. Balanced and harmonious, these models are very attractive variations of the traditional Nontron knife. 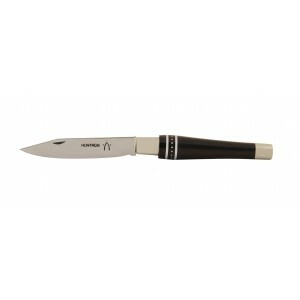 Pocket knife, nickel-silver turning ferrule, double ferrule handle made from ebony and aluminum, shiny finish. 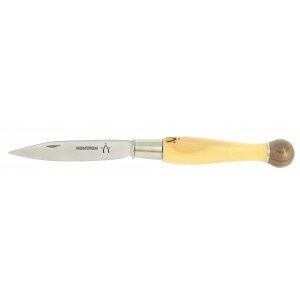 Available with 8 cm or 9 cm blade made from T12 resistant steel. Pocket knife N°25 BO SP EB/C, nickel-silver turning ferrule, ball shape handle, spiral marquetry made from ebony and white Corian, shiny finish. 9 cm blade made from T12 resistant steel. Pocket knife N°25 BO BU/AMA, nickel-silver turning ferrule, ball shape handle made from boxwood and amaranth, matt finish. 9 cm blade made from T12 resistant steel. Pocket knife N°25 BO BU/NO, nickel-silver turning ferrule, ball shape handle in woodburned boxwood and walnut, matt finish. 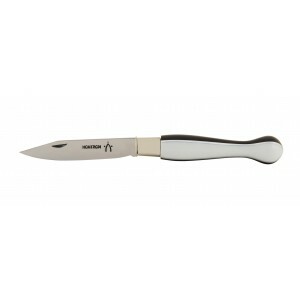 9 cm blade made from T12 resistant steel. Pocket knife N°25 BO DA EB/C, nickel-silver turning ferrule, ball shape handle, checkerboard marquetry made from ebony, black and white Corian, shiny finish. 9 cm blade made from T12 resistant steel. 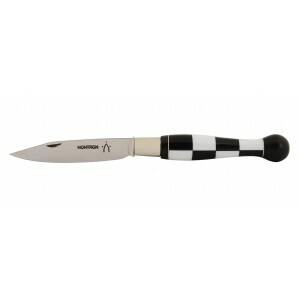 Pocket knife N°25 BO EM CO BN, nickel-silver turning ferrule, ball handle made from black & white corian, shiny finish. 9 cm blade made from T12 resistant steel. Pocket knife N°25 BO EB/ALU, nickel-silver turning ferrule, ball shape handle made from ebony and aluminum, shiny finish. 9 cm blade made from T12 resistant steel. Pocket knife N°25 BO AC, nickel-silver turning ferrule, ball shape handle, rainbow marquetry made from acrylic, shiny finish. 9 cm blade made from T12 resistant steel. Pocket knife N°25 BO EB TRU, nickel-silver turning ferrule, ebony handle sculpted as a truffle, ball shape, matt finish. 9 cm blade made from T12 resistant steel. Pocket knife N°25 BO EB/BU, nickel-silver turning ferrule, ball shape handle made from ebony and boxwood, shiny finish. 9 cm blade made from T12 resistant steel.